Many European modelers control their model trains with signals. This can be automated if the modeler desires, and the process of such automation is made much easier by computer programs such as Railroad & Co. The topic of model railroad signaling is a complicated one. Here are two basic examples using the older Minitrix signals, one color-light and the other a semaphore. 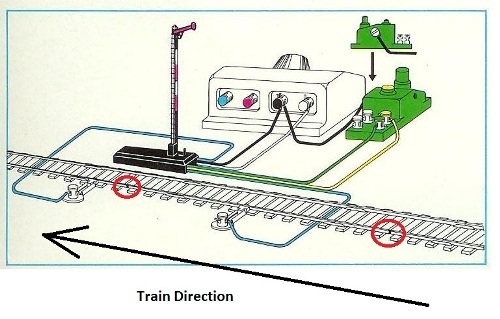 Control of model trains with signals combines a control device connected to a signal. In turn, a segment of track is defined by isolating one rail at two locations. This example uses the 6759 color light signal combined with the 6594 control button. 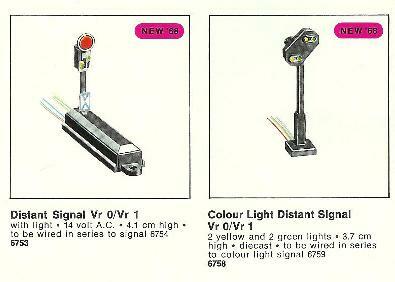 The 6759 signal is an older signal, and there are other color-light signals in the Minitrix product line. The 6594 control box is a continuous device, which means that it cannot be used with solenoid devices such as the 6754 semaphore signal, which require momentary electrical pulses for operation. A black wire is connected between the transformer Black terminal and to the side of the 6594 control box. The green wire and a red wire of the 6759 signal are connected to the green and red terminals of the 6594. The white wire of the 6759 completes the circuit from the signal back to the White terminal of the transformer. The color light signal is placed at the appropriate location, which is next to a segment of track that has been isolated from the rest of the railroad. This section is defined by insulated joiners on the “Blue” rail of the railroad. In practice, the rail could be either the Red rail or the Blue rail, but if you are using locomotives which operate from the overhead catenary wire, it is important to maintain discipline when creating insulated segments for train control. 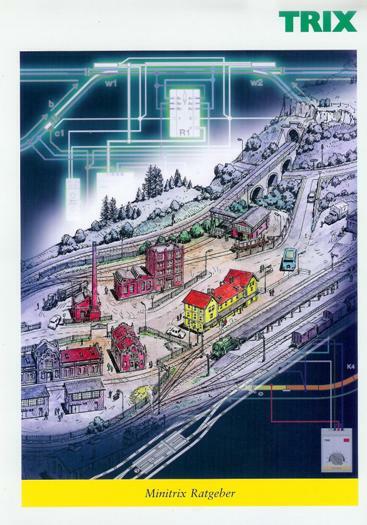 This is because all of the locomotives operating on the railroad, either from both rails or from the catenary, share the Blue rail connection of the power supplies used to control the trains. When the 6594 is “Green”, the 6759 is indicating green and current flows through the white contacts to the isolated segment of track. When the signal is in the “Red” position, the two white terminals are open and no electric current flows through these contacts. When a train approaches the red signal, it will stop when it enters the isolated segment (which must be long enough to stop a moving train). When the signal is turned to green, the train proceeds. 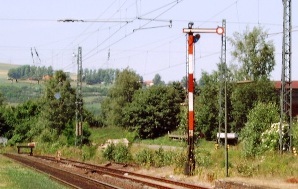 The 6754 represents an older style of German railroad signal. It is different than the color light signals in that it contains two solenoid coils for operation. In addition to operating the semaphore blade, these coils also operate a set of electrical contacts that can be used to control the defined track segment which stops trains when the signal is red. Because the semaphore has solenoid coils, it is controlled by the 6595 momentary control. It cannot be controlled by the 6594; doing so will result in the solenoid coils burning out. The 6754, and other semaphores, also have more electrical connections. As per Minitrix wiring protocol, a green and a yellow wire connect the 6595 to the semaphore. Pushing the green or yellow button on the 6754 will result in the semaphore changing its indication. The blue wires coming from the semaphore are connected to the defined stopping segment of the track adjacent to the semaphore. 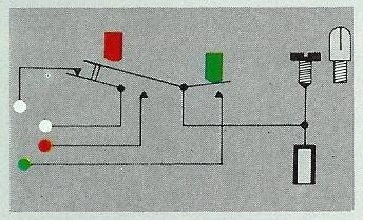 Note that the semaphore has both a white and a black wiring connection to the transformer. The white connection provides a return current path for the two solenoids. The additional black wire is for the internal lamp of the semaphore, which backlights the colored lenses of the semaphore blade. The 6753 is used in conjunction with the 6754 semaphore. In this illustration it is showing that the Home signal is indicating “Stop”. The yellow disk is in a vertical position and the colored lights are showing two yellow indications. If the Home semaphore was indicating “Proceed”, the yellow disk would be flipped to a horizontal position and the colored lenses would be showing two green indications. The 6758 would show two yellows if the Home signal was indicating “Stop” and two greens. Both of these signals are wired in parallel with the home signals. The 6753, like its home signal the 6754, has two solenoids. Since it is a distant signal, it does not have any train control wiring, which is done by the Home signal. The 6758 has green, yellow and white wires, which are connected to the same contacts as the 6759 color light signal. German signals are more complicated than what has been discussed here. For more information, please see here. 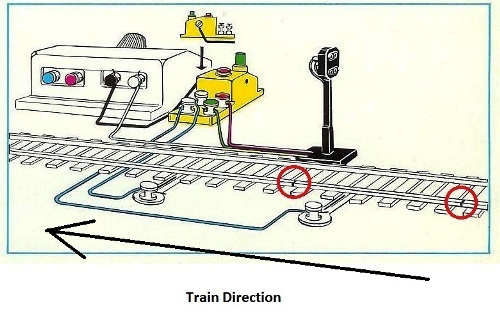 Train Control - The above signals can be used to control train movements. As you will see, this is easier to achieve with the semaphores than it is with the color light signals, but both approaches can be used for train control. Train Detection - For the signals to operate properly, there must be a way to detect the passage of trains. For purposes of illustration, your railroad would be one large oval with two trains operating on it. When a train passes a Home signal, this signal is turned red. The following train approaches the red signal and stops. Meanwhile, up ahead, the first train passes a specific point and when it is detected, the first Home signal turns back to green and the second train starts back up again. This turns that signal back to red. Up ahead, the first train turns the next signal red and continues on. As the second train approaches this signal, it again stops until the first train is far enough ahead, and so on. In practice, such an automated layout should be large enough to have at least four such control signals, if not more. Each insulated section at each signal must be long enough to stop a moving train. Likewise, the segments between the signals should be at least twice as long than the longest train, just so things don’t appear to be crowded. For layout automation to work properly, you cannot simply be standing there pushing the buttons of various 6595’s and 6594’s. Well, you can, but you’ll tire of it soon enough. So, you set up detection devices that operate the signals for you. There are several approaches. Minitrix makes two track pieces which can be used for detection. The 14979 Contact Track works as the metal wheels of a locomotive passes over it, sending out an electrical pulse. The 14980 Contact Track uses a micro switch embedded in the track base; it is activated by a magnet placed on the bottom of the locomotive or car. You can also use IR photocells that are manufactured by other vendors. In all cases, these detection devices send out electrical impulses to operate the signals. In the case of the 6754 semaphore, these pulses can be sent directly to the solenoid coils of that signal. In the case of the color light signal, you must add a relay to both control the color lights and to turn the stopping segment of track on and off. In this way, the semaphores, although more expensive initially, are actually about the same price as the combination of the color light signal and the relay. Each color light signal must be fitted to a relay. 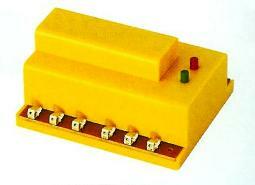 There are a large number of different model railroad relays out there. 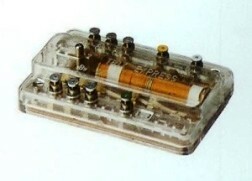 Trix manufactures two relays. The 66592 is the more conventional type of relay manufactured by Minitrix, with two solenoids and a two sets of electrical contacts. 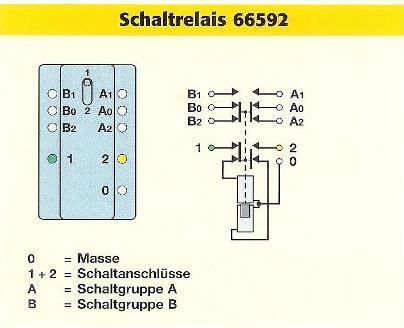 Internally, the 66592 has two solenoids; “0” is the white transformer connection, “1” and “2” are the solenoid connections, which are operated by either the detection device or by a momentary control, either 6595 or 6596. There are two sets of electrical contacts, “A” and “B”, “A0” and “B0” are the common connections, “A1” and “B1” are one position of the electrical contacts, “A2” and “B2” are the other. In operation, when the relay is in the position illustrated above, you would consider this to be the “Proceed” position of the signal. In that case, white transformer connection would be made to “A0”, with one wire going from “A2” to the green indication of the color light signal. At the same time, the blue track connection for that signal’s stopping track segment would be made between “B0” and “B2”. The other signal connection would be between “A1” and the red connection of the color light signal. When the relay is in the opposition position of the illustration above, then the signal will indicate “Stop” and there will be no power to the signals stopping segment. The 66597 is a more advanced relay; electronics enhances the sensitivity of the 66597. Over the years, Minitrix has offered technical and layout manuals which may be of assistance. These turn up on eBay periodically and although they are in German, you can usually figure out how things fit together. Currently, the layout and technical manual in print is No. 69016, which is in English. The German language version is No. 60912. Both can be can be obtained from your dealer. Although the topic of automated signals is intimidating, it is also worth the effort because of the final results when you stand back and watch the trains operate realistically. The idea is to break things down into individual components and get one device operating properly at a time. You can do it.